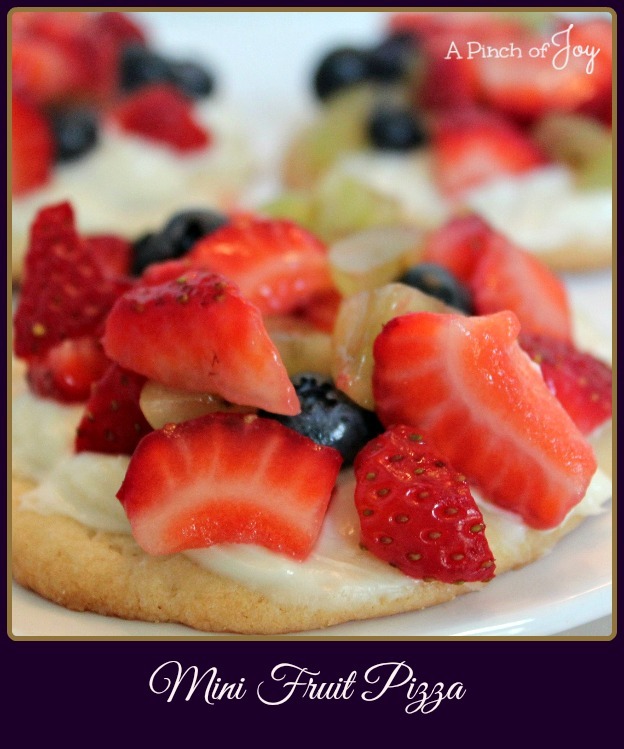 Mini Fruit Pizza. Or Fruit Pizzettes. I thought I was inventing a new word to describe individual pizzas. Then I googled to be sure it wasn’t something obscene in some language I don’t speak. Guess what? The Italians, who created pizza, also created pizettes. And that is exactly what it means. Individual or small pizzas. Perfect description for these little fruit tarts. You can use your favorite sugar cookie recipe and bake 4 inch round cookies. Or you can shortcut and use a sugar cookie mix. Or do what I did and use the refrigerated roll of sugar cookie dough. I cut the slices of dough just a smidge thicker than the directions specified and slightly smushed them with the palm of my hand to make them larger. You can freeze the cookies after baking and pull out a few at a time to make Fruit Pizzettes as needed. The fruit topping tips it toward the healthy side. (Right?) The individual servings. are perfect for picnic gatherings. You can transport the individual parts and assemble on site which is great if traveling an hour or two to the family reunion. Or make at home and carry in. Makes a spectacular addition to the dessert table on a big tray! When cooled, spread with the cream cheese filling. Use any fruit juice with a flavor that will complement the fruit you plan to use to help thin the cream cheese. I used orange juice because I like the flavor. The recipe makes enough filling to cover a dozen four inch cookies. Two dozen cookies would require the entire 8 ounce bar of cream cheese, ½ cup sugar and two tablespoons of juice. Cutting the fruit into small pieces makes the finished fruit pizza easier to handle and eat. It’s a good way to use up small amounts of different fruits. I used strawberries, green grapes and blueberries mixed together. You can easily customize toppings on a few or all to accommodate different tastes or needs like allergies. The combination of flavors is limited only by your imagination! Beat softened cream cheese, sugar and juice until smooth. Add nutmeg, if desired, and set aside. Prepare topping fruits, chopping, seeding or peeling as needed. Gently mix topping fruit together in small bowl. Spread filling on each cookie. Top with generous spoon full of fruit.